"There comes a time in every woman's life that the only thing that helps is a glass of champagne"
I'm going to paraphrase it and say that there comes a time in everyone's life when the only thing that helps is a beef daube and a glass of barrel aged Cabernet Sauvignon. I don't want to sound disrespectful to the elegant and delicate fizzyness of champagne (or any other sparkling wine) but there are some days when if there is a chance for them to get better it is only going to happen with a comforting plate of tender beef braised for hours in rich red wine and bacon sauce and glass of full bodied, smoky chocolatey and spicy Cabernet Sauvignon. Even describing it makes me feel ready to get out of bed, this wintry, rainy day and go get myself another plateful and another glass of wine! This recipe was a revelation for me! I've been cooking with the French Fridays with Dorie crew for a few months now and we have made some truly delectable and delicious recipes from Dorie Greenspan's book "Around my French Table", but this one was screaming France, and especially Provence, from the oven! 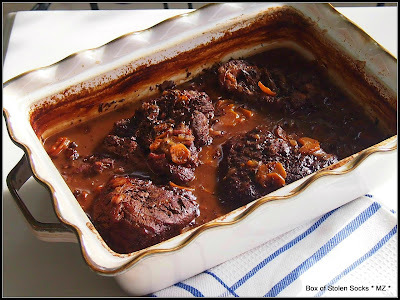 Beef daube (daube de beauf - en français) is a rustic and comforting plate of food you expect to find in any small or big auberge. The smell of succulent meat, cooking slowly in a rich red wine sauce was enough to make me want to book a ticket to get there as soon as possible!! There are so many variations, I could use up most of my post to describe them. Instead I will just describe Dorie's version. It is simple and easy to prepare with a unexpected twist in the end that elevated the dish from a simple wine braised cut of meat to a gourmet creation which guaranties satisfaction around your dinner table. I used beef chuck, cut in 4 pieces and quickly browned it in a bit of olive oil. Then sautéed some thinly sliced carrots and onions with quite a bit of bacon (can't help it I love the stuff). And here is were it becomes interesting, instead of removing the sautéed vegetables and bacon and de-glazing the pot with the wine and beef stock, Dorie keeps everything in the pot, adds a couple of tablespoons of flour and let it "toast" for a short while. Then she pours in the wine and beef broth, scrapping the bottom of the pot with a wooden spoon to get all the nicely browned flour mixed with the rest of the ingredients. Transfer everything in a crock-pot, put it in the oven and forget about it for a couple of hours. This is the hardest thing to do actually!! The smell, oh! the smell will not let you forget it one moment...I warn you.. you would want to open the oven and check to see if its done yet but you have to resist the temptation and let it cook slowly for at least 2 hours...You will thank me later. And then, when the wait is over and the sauce is bobbling, and the meat is melting at the touch of your fork and you just want to dig in and forget the world around you, just wait, hold on for a couple of seconds, inhale the aromas and stir in a small piece of chopped dark chocolate. Yes! you read it right, dark chocolate. It is a heavenly inspiration that binds all the flavours and aromas together, without overpowering them with its bitterness. I was truly smitten by this recipe. I am going to make it again and again and again. sounds like this one really hugged you! :) This was a really special dinner! Oh, man, reading your description of it just makes me want to have it again! I loved this dish, and I loved how it does transport you to this rustic world of farmhouse dinners and cozy winter nights. This daube just works a special kind of magic. Beautiful job! Thank you Sara! It was one of the best meals I had in a long time. It really made me happy, sounds silly but sometimes happiness is so simple as a good, flavourful plate of food!!! This was a lovely recipe, wasn't it? And I agree, there are some days when only a serious dish and a serious glass of wine will do. It was an amazing recipe Cher! One of the best! This recipe is comfort food all the way. I'm glad to hear it enchanted you. Have a great weekend! Thank you Betsy! We all enjoyed every bite of this dish!! Great pictures! This is comfort food at its best. Thank you very much! I agree comfort food for body and soul!!! Fantastic description of ALL of it! Bravo! Luscious looking! We loved this one…truly a great comfort food! Enjoy your weekend, Maria! 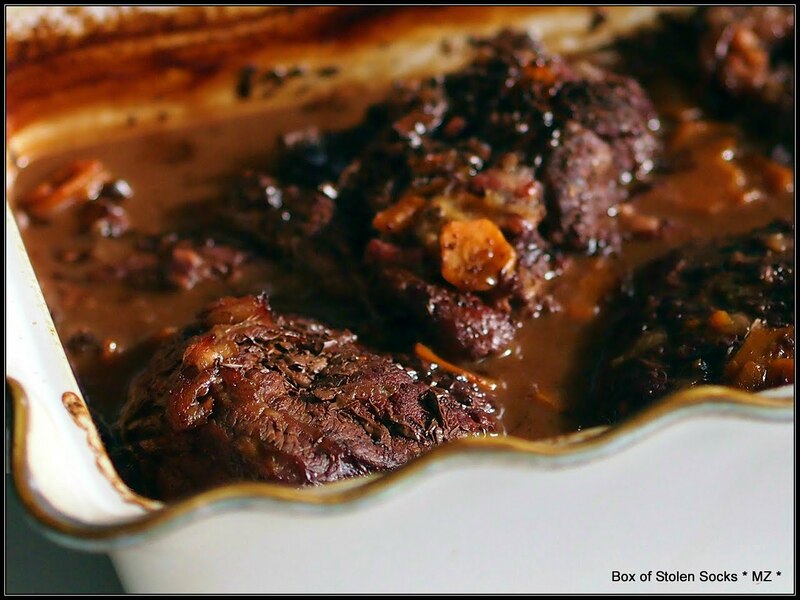 Maria, sounds like you really enjoyed your delicious looking Beef Daube! Love your very beautiful serving dish! This is so funny, Maria - when I served this for dinner with two of my friends, we drank both champagne AND a hearty red wine. Yes, it doesn't get better than that. I agree that this was a very, very delicious daube. I just wish I could have found beef cheeks but I will keep looking. When I find them, I am definitely making this again. Nice Post. Hi Maria I think your idea of starting the daube in a dutch oven and then transferring it a crockpot, esp. if you need to leave the house, is a great idea. 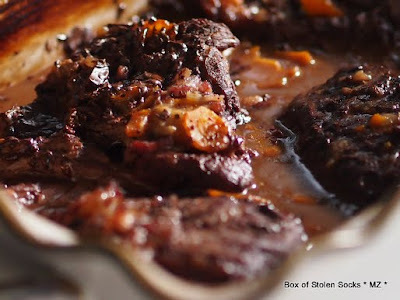 I think you do sacrifice a little thickness to the sauce when I've tried this with american beef stew, but it worth it if you don't have the time. We were fans, too! Beautifully done...and I really LOVE your baking dish!